The quaint neighbourhod of Kerrisdale, located in Vancouver West, dates back to the late 1800’s with its involvement in the BC Electric Railway and streetcar service. It was an important hub for interurban transportation along what is now West 41st Avenue. Kerrisdale officially became a part of the city of Vancouver in 1929 and is known today as the commercial and political center of the Point Grey community. Kerrisdale has an upscale feel and is a prominent neighbourhood with an interesting mix of newer houses, older mansions and bungalows. Many of Kerrisdale’s residential streets are lined with sweeping, hundred year-old oak trees, some of which are older than downtown Vancouver buildings. Today, this established community is experiencing changes with new development, culture and demographic shifts. 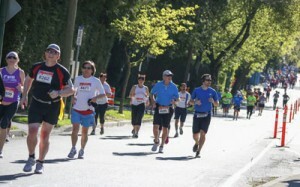 All Marathon and Marathon Relay Runners enter Kerrisdale around kilometer 3 and take in the older character houses of Shaugnessy – an affluent area within Kerrisdale. After hitting Granville Street, runners will find themselves beneath an arched canopy of Vancouver’s oldest trees. Both charming and historic, Kerrisdale is a renowned neighbourhood within Vancouver and unique to the Vancouver Marathon course. Run Vancouver’s only Marathon. RunVan: The best way to see this city.